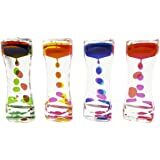  PREMIUM PULL & STRETCH BALL SET: If you are looking for great and effective ways to reduce stress and at the same time have some fun, then we got you covered. 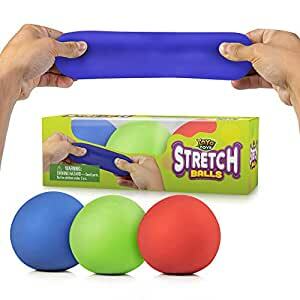 We proudly present you the best squeeze ball set that will become your favorite companion from this day on and will allow you to play around no matter where you are, no matter what you are doing. 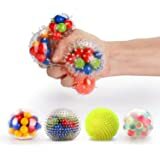  DURABLE CONSTRUCTION SENSORY SQUEEZE BALL TOYS: Forget all those cheaply made stress balls and invest on our well-constructed squeeze bouncing balls from now on. They are made from resilient materials and can withstand some heavy duty use either from you or your children. 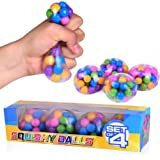 Squeeze them, bounce them, pull them all you want and create fun shapes with these malleable balls.  EXCELLENT CRAFTSMANSHIP BOUNCING EXERCISE BALLS: Do not compromise with anything less than perfection when it comes to your sensory stimulation toys and equipment. Trust our colorful squeeze balls and enjoy supreme levels of comfort and relaxation every time you hold one of our elastic balls in your hands. Their ergonomic 6" size, makes them easy to grip and carry around while walking or talking on the phone!  MULTIPURPOSE STRESS RELIEF BALL SET: Upon designing this elastic stress relief ball set, we tried to make it as multipurpose and convenient to use as possible. This set makes a fantastic gift idea for all kids out there but also can be used for therapeutic purposes as well. 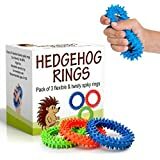 Use it as a fidget toy, anxiety and stress reliever toy, great for people with special needs and disorders (ADD, ADHD, OCD), for autism and many other cases. 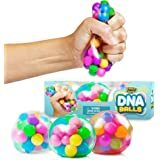  STIMULATE FINE MOTOR SKILLS WITH THESE BALLS: Our anti-stress balls can help you and your kids develop fine motor skills, become more creative and improve problem solving situations. You can take them along everywhere you go, either in the work office, after sports games, while sitting in class or going for a walk in the park. Keep an extra one in your backpack, stroller and glove compartment just in case you need instant calming! Suitable for kids and adults of course, they will surely ameliorate your moody days, uplift your spirit and make you feel good and confident about yourself again. Touch one elastic calming ball, squeeze it, pull it, shape it and forget the world around you! At last that peace and quiet you truly deserve! Our pull and stretch ball bouncing set is made from durable and absolutely safe to use materials. The soft yet resilient cover is filled with foam putty thus allowing you to stretch it and bounce it on the floor or wall without worrying about breaking unlike other squeeze balls in the market. It makes a thoughtful gift to a dear friend that has been suffering from daily stress and anxiety! What are you waiting for? Get your colorful sensory ball set today and let the squeezing games begin! Bough these as Christmas gifts to give to my 2 and 13 year old and my husband. They all broke today, the same day they got them. They feel great, for sensory or autistic people, but unfortunately the quality of the rubber that holds it together is just so poor. My husband and 13 year old simply squeezed them, didn't pull or twist or anything, regular stress ball squeezing and they busted. We're all bummed because the feel of the balls were so great. Such a shame. Hope the product improves the rubber part of the ball so it's worth buying. Would have bought several more! 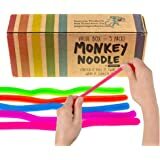 Okay so for how much my autistic son LOVED these, I would've done 5 stars. But I had to rate it 3 stars because the plug in the ball is easily pulled out/apart and the filling starts to leak out. This is one of the only toys that helps his meltdowns so I'm kind of heartbroken they ripped open so easily. He is 2 and 1/2 years old and I decided not to buy more because he tried putting the putty/filling into his mouth. I tried super gluing the plug back in but it quickly pulled apart after squeezing it again. These might work if you just squeeze like stress ball but once u start stretching it, it starts to ruin the plug. Maybe we got a bad batch? My son has been playing with the red one for 3 days now and the plug is still sealed and the ball is fine. So maybe the blue one was just faulty. I'm hoping it lasts =] I changed my 3 star rating to 4. So happy he's getting some use out of this ball!!!!! You should not market this to autism parents unless it’s durable. My son started chewing on this (as he has autism) and almost immediately broke the seal and the insides came out everywhere. I’m pretty upset I paid $16 for 3 balls that were destroyed within hours. Don’t say it’s a resilient coating, because it’s not whatsoever. I was SO disappointed that these didn’t work out! The feel is amazing! Way better feel than most stress balls, however - one lasted less than five minutes before exploding and spilling the goo everywhere all over my son, and the other two lasted a whopping 7 and 8 minutes before doing the same. We didn’t even have a chance to stretch them!! That was just squeezing in our hands. Our kids aren’t even old (none over 10, and the younger two aren’t even strong enough to squeeze it all the way!) As much as I completely loved the feel of these, I advise not to purchase because they are NOT safe toys for kids and would be aggravating for an adult to squeeze and have it explode all over work clothing! I have an 8 year old granddaughter that needs an outlet at times. I ordered these hoping it would help her. When she got them she asked if she could keep on here, take one home and take on to school. I thought that was great. She was having a stressor going on and she immediately grabbed one of the balls and kept squeezing and pulling it. After about 5 minutes she said she felt better. I am so thankful I got these for her and she is using them. Very pleased with this purchase.